Lets move on to what I got from this month VT! Full size product! This kind of product is very new to meet. I get the one in this gorgeous flowery vintage design that I really like! The only problem is I think this nail art is suitable for people with have long nails, I still can’t figure out how to use it with my short nails. Hehe. But its kinda fun! Perkins Nail Wrap offers 21 glamorous designs to be choose design uniquely from Korea. This method is different from the old fashion nail lacquer technique that require drying time, this is kinda like a sticker that wrap up your nails and look like a real nail polish that already have it own unique design to it. Another product from Oriks since VT Trove arrives in Malaysia. This “cool name” cream is develop in France and claims to be a cream that smoothen the wrinkle, tighten pores and brighten your complexion. Contains more than 90 natural minerals to boost up your skin vitality and also protect your skin from harsh environmental stressors. Suitable for hot summers sun which actually happen to us Malaysia all year long. This box also include a coupon from Oriks where If you are satisfy with this cream you can purchase it in full size and get a FREE Plantinum BB Cream worth RM138 each! Promotion ends 31 May 2013. Another full size product! Yeah! I am very happy because it’s a makeup product! The color I got are also pretty nice and versatile. 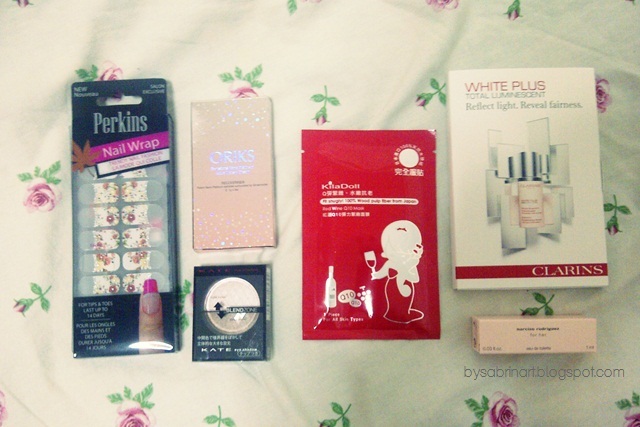 It retails for RM49 with actually cost the whole box of VT. So I think it really worth it! It claims to be a great eye shadow quad for beginners and comes in 8 different hues. The quality if this eyeshadow is excellent, smooth and velvety! This mask is not included in the product description card. Another mask to try! Awesome! Claims to be the most advance skincare for a fairer and healthier akin. Contains Trans-Luminescent complex, it has the ability to revive your skin’s micro-mirrors at every layer so that your skin appears clear and radiant. The sample contains 7 pack of sachet. Which a trial pack for a week. That is a pretty nice sample that you can actually use within a nice period of time to see the result. I am excited for this one because I heard Clarins is a good skincare brand too. 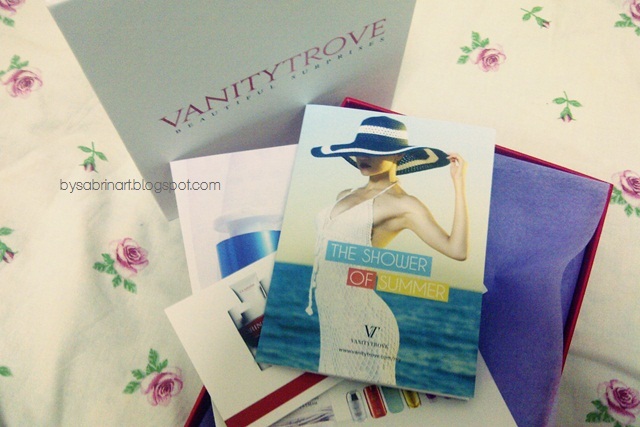 There are 4 options of perfume offered to Vanity Trove subscribers this month. I got the Elie Saab. The other subscribers may get this one or Jean Paul Gaultier, Narciso Rodriguez or the Issey Miyake. Scent describe as an ode to the designer memories of the Mediterranean and the scent of orange blossoms in the air. I love perfume samples because it comes in handy in your pocket! Along with this sample it came with a “Discover your scent” class with Danny Ventura featuring all these 4 brands of fragrance that will be held during the end of April. Seats can be book by reservation First come first serve basis by emailing your details to Valerie@vanitytrove.com . I am very happy with this month VT box. It’s a good improvement since last month box which actually pretty much awesome when starting from this month box only cost RM50. The product VT trove subscribers receive is so worth it. From skincare, to nail care, makeup. The coupons that they gave are also reliable and nice. I think VT is worth subscribing and hope they maintain this kinda of boxes in the future. If you love surprises then subscribe to them!